As Secretary of State and a close confidant of President George W. Bush, Condoleezza Rice is the most influential woman in the history of the United States government, and perhaps one of the most famous black women in the world. Her latest stint in Washington, D.C., follows her role as National Security Advisor to the President and a distinguished career as scholar, professor, provost, and foreign policy advisor that has taken her from Birmingham, Alabama, to Denver, Colorado, to Palo Alto, California, to the White House—all by the age of 50. But just who is this powerful woman who has experienced firsthand some of our nation's darkest and brightest moments, who was a key player in the government's response to the September 11 tragedies, and who some believe will likely be a future governor, senator, vice president, or even president? Drawing from exclusive interviews with dozens of relatives, colleagues, friends, and teachers and from scores of previously published interviews and articles, Antonia Felix gives us the first biography of this extraordinary American—a poised, immensely appealing, fiercely loyal, and deeply religious woman, whose passions include music, football, and Russia. Her remarkable story is founded on a compelling family legacy. With ancestors on both sides who were white slave owners and slaves, Condoleezza Rice comes from two lineages, the Rices and the Rays, devoted to education and achievement. She was born in segregated Birmingham in 1954 and grew up in the upwardly mobile, high-achieving, black middle-class enclave of the city. Her music-loving parents, both educators, named her after a musical term, con dolcezza—to play "with sweetness." The Rices started their only child on piano lessons at age three and filled her childhood years with ballet, figure skating, tutoring in French and Spanish, football viewing, and a constant flow of books at her bedside table, setting forth a standard of excellence that would give her the "twice as good" edge necessary to be on an even standing with her white peers in the segregated South. While in training to become a concert pianist (a dream she eventually cast aside), Rice graduated from high school at 16 and from the University of Denver at 19. She ultimately found her career calling from her professor there, Josef Korbel, former Central European diplomat and father of former Secretary of State Madeleine Albright, who sparked her passion for Soviet studies. After receiving a Ph.D. at age 26, Rice became an assistant professor of political science at Stanford, starting on the path that led to her becoming the youngest-ever provost at Stanford, the youngest and first-ever female national security advisor, and the first black, female secretary of state. The story of her path to excellence is an inspiration to all, regardless of politics. 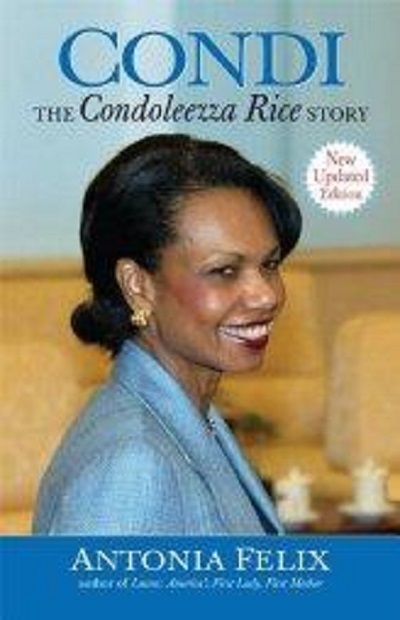 Ms. Felix's book, Condi, not only gives us the first comprehensive portrait of the person who has the president's ear perhaps more than anyone else in his administration—a black woman who has risen to the top in a field traditionally dominated by white men—but also a greater understanding of and insight into the workings of the White House.